I thought in honor of what day is is we should do something for it. I thought we should create monuments to the fallen characters as they did for this card. 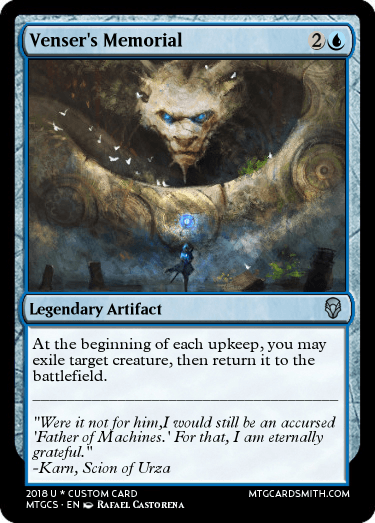 The idea is the card should honor a fallen character, whether be a legendary creature or Planeswalker and mimic their abilities in some way. Whatever or whomever it is. It does not have to be an Angel despite both examples being one. (though there's alot of dead ones lately.) Permanents can be artifacts, enchantments or lands. I suppose if you got a really good Legendary Instant or Sorcery that somehow works for said character Go for it. I'd accept any cards that meet the requirements new or old , I doubt too many people made the proper cards ahead of time but if you did, more power to you. This for fun so generally I favorite the entries, but if you do something awesome, I will favorite something else as well. I figure will let it run for the week incase anyone misses today, or whenever interest flatlines heh. I made it late last night before I knew about your contest so I don't think it quite meets the criteria except that it was made with Memorial Day in mind since for me that's tomorrow (I live in Ohio). Anyways hope you like it. It's in theme, which is the only card anyone has submitted, so by Default it's the best one as of now heh. No biggie, this was just a random idea I had click at the last moment and decided to try when Phelgming suggested someone could do a series of Memorials on my card for Radiant, so I put it out there. Not every idea going to get traction. Does a character from Portal Three Kingdoms set count? Any magic legend works @Deepsky. Wait, Is this still going on? yeah we're still going, oh one thing, put a link to the card it's a memorial for on the created card(or your post. ), just so I can easily compare it against it the two. I was aimming for magic characters not Warcraft., but due lack of entries I ll take what I can get. I will be entering this today with one or two cards. Just wanted to let you know. I have two entries for this. 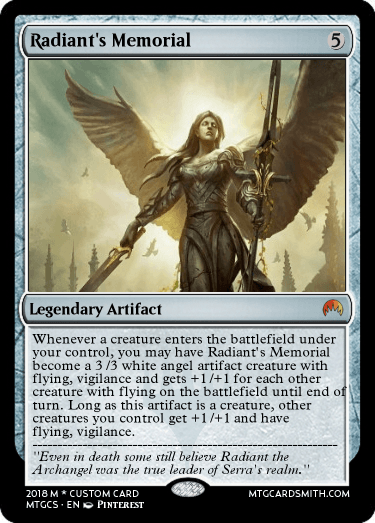 The first is a memorial to the Archangel protectors of Innistrad, and provides bonuses based on all four of them (Avacyn, Gisela, Sigarda, Bruna). 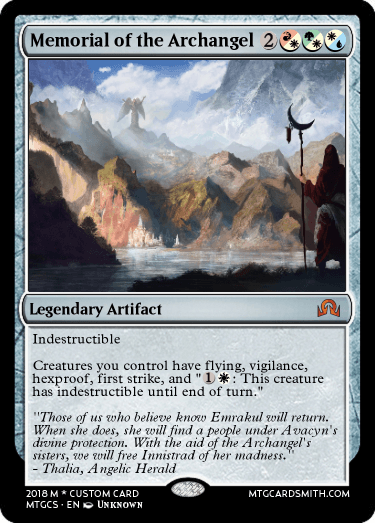 The second is a memorial to my favorite Planeswalker (who I really hope they bring back from the dead someday), Elspeth. Edit: Updated the cost of the indestructible on Memorial of the Archangel. On a side note... I HATE what they did to Innistrad. It's my favorite plane by far, and I absolutely love all four Archangels... but nope! One is dead, two are a fused eldrazi abomination, and only one still lives. F you Sorin. Seriously, F you. I blame you for what happened, you worthless guardian. I could go for much longer, but I'll stop now. A memorial to my most favorite planeswalker. @Lujikul why did you have to do that? You're just making me sad again. 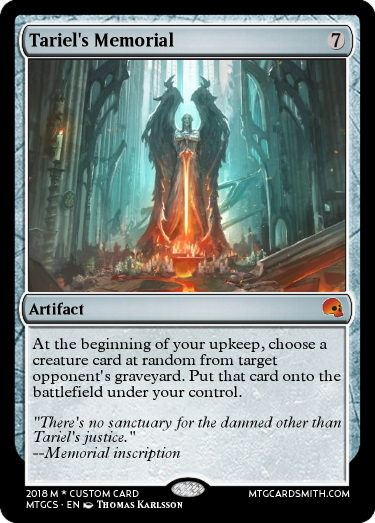 Stumbled upon this while working on cards for my imaginary Theros: Returned set, which focuses on Elspeth's return from the underworld. 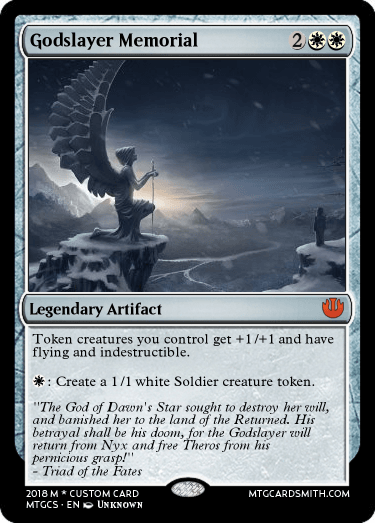 This memorial pays homage to the Elspeth planeswalker cards of the past, buffing creatures and creating tokens (with a new Spirit Soldier token!). I wrapped this up, and favorited everyone who did what was asked. Thanks for honoring the day and contest.